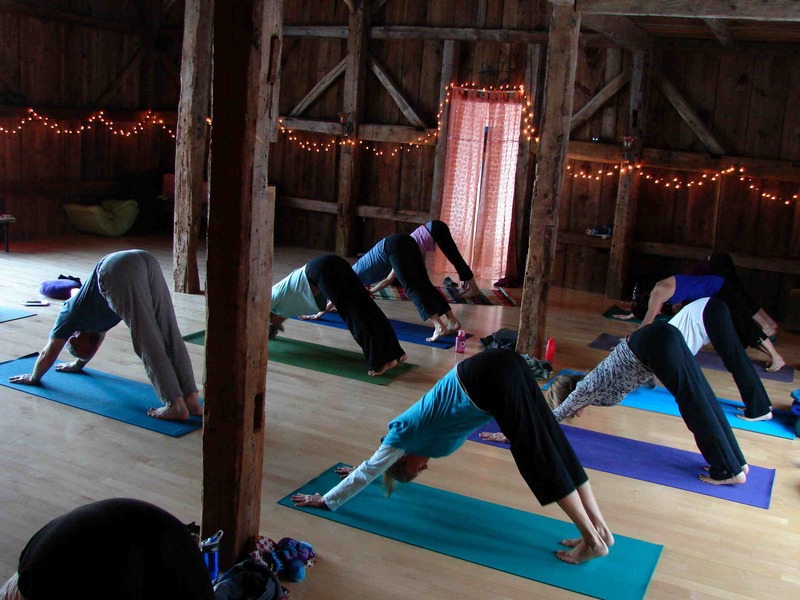 Below is a listing of classes taught at Dragonfly Yoga Barn. Not all classes are running at the same time on our schedule; some are seasonal or offered in a series. Vinyasa Flow Classes @ Dragonfly are all about transition. The word Vinyasa means to place mindfully, and what this really means is that transition is everything. In order for the transition to be meaningful it must happen in coordination with breath, as the body is the vehicle for PRANA, or life force, to stir, clear blockages, and promote wellness on all levels. Katie’s Vinyasa classes incorporate another important philosophical facet: the creation of (Brahma), preservation of (Vishnu), and destruction of (Shiva) each asana, which asks us to be present with our bodies and minds at each stage of the pose. Creation and destruction are the movers and shakers–the Vinyasa! Preservation is the holding of a pose and what it means to stay with our bodies, offering a place for what comes up and developing the strength to be with it, the sthira and sukha of the pose. It is this somatic mindfulness on the mat that teaches us how to practice yoga off the mat and in our lives. Slow Flow and All Levels Flow classes include Sun Salutations, but classes are less vigorous and more about creating a strong foundation in the practice and cultivating prana via breathing practice. In these classes we spend more time breaking down postures, learning proper alignment, and developing strength and stamina–but at a pace that suits most people, whether they are strong beginners or long-time practitioners. Slow does not mean “easy,” as we certainly do challenging poses and sun salutations in every class; but it does give participants a little more freedom to slow down, rest when appropriate, instruction on how to modify poses, and to practice in a way that honors the body. A “slow” practice is great for strong beginners, intermediate, and advanced students, for those who want to work on developing flexibility, balance, strength, and awareness, and for those who enjoy a flow class, but prefer a slower pace for movement and breathing. Shakti Flow is a vinyasa class designed for yogis who enjoy a stronger practice and a combination of flowing sequences that marry movement and breath so that each practitioner can tap into one’s own evolution in the practice and follow the body-breath wisdom that underlies a flowing practice. Vinyasa’s strength is in its diversity, as every class and the sequences taught are different each time we meet and often relate to the energy of the group. You can always expect warming stretches, sun salutations, balance poses, inversions and standing sequences in this class. Be prepared to breathe, move, and be challenged in body and mind! All classes end with a savasana, or relaxation time. 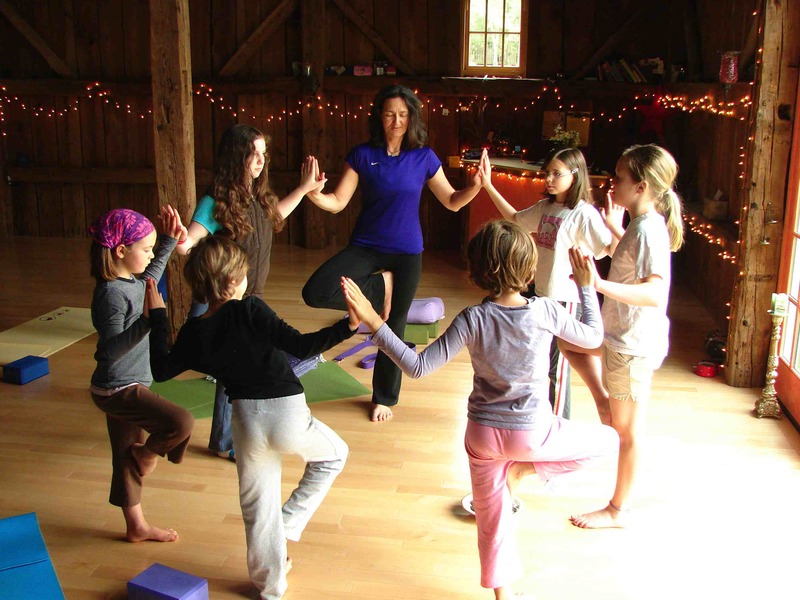 Katie teaches Shakti Flow style at The Fitness Edge in Meredith, NH. Restorative Yoga: Restorative yoga is great for every body, offering a respite from the stress of daily life and work, and calming the sympathetic nervous system so the parasympathetic nervous system can take over, allowing the body to relax and heal. It is especially helpful for those recovering from illness or trauma, as well as for women in pre or post natal care whose bodies are lovingly supported with restorative postures. For those who find slowing down difficult, this practice is essential, complementing an active person’s workout practice, and simply allowing for a restored sense of Self. 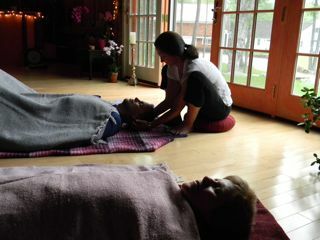 Honor your body and quietly rejuvenate your spirit while the poses soothe the organ system and allow the brain to quiet. Using bolsters, pillows, blankets, and other props to support the body in a variety of passive poses, students remain in a given posture for 10-15 minutes, focusing only on the breath as they are eased into a state of relaxation. Peaceful music, poetry, and guided imagery help participants to release stress, tension, and “let go” of what does not serve the body and mind. This is the dessert class! Katie was first introduced to Restorative Yoga at a workshop with Judith Lasater in 2000, studied Restorative and Yoga Therapy with Cora Wen in 2010, and was certified in Restorative Yoga by Kripalu and Sudha Lundeen in 2011. Restorative Yoga & Reiki: The perfect pair! Take everything in the description above, and add Reiki… you’ll never want to leave the studio! Katie offers instruction in restorative yoga while Leslie Jose, ARMT, LMT, along with Katie (Reiki II) offers Reiki healing to everyone who wants to receive it. Students are visited during each pose to aid in the movement of blocked energy and the intention to heal dis-ease in the body. Inspiring readings, intention setting, relaxing music, and candlelight create a profoundly beautiful opportunity to practice a very healing kind of yoga. Yoga Nidra~The Art of Conscious Relaxation: An ancient and powerful healing modality found in the oldest philosophical yoga texts, and that offers the participant a deep state of conscious rest and relaxation during which one’s awareness of the subtle energy body is expanded. While reclining comfortably, participants are guided through each of the koshers (five layers of your being), all while remaining perfectly still. The goal is to remain “awake and aware,” even though the physical body is enjoying profound rest. Yoga Nidra is proven to: *balance the autonomic nervous system *create calm in the body and mind *strengthen the immune system *lower blood pressure *relax the busy mind *incite our natural ability to heal ourselves *increase one’s creativity *increase the flow of prana in the body *relieve pain, and more! Conditions addressed by Yoga Nidra practice: PTSD, ADD, ADHD, insomnia, MS, chronic pain, anxiety and depression, cancer, eating disorders, digestive conditions, addiction, aggression, stress, asthma, and the list goes on! Katie is certified in this method by the California College of Ayurveda. Thai Yoga is a private client practice of metta or loving kindness, originating in India and migrating to Thailand 2,000 years ago. Rooted in Ayurveda, meditation, and Buddhism, the ancient practice was a spiritual one, intertwined with bodywork and focused on specific meridians (in Thai, called Sen lines), which activate the flow of prana (as in yoga class), also known as “ki” or “chi” in Chinese and Japanese practices. This vital life force travels through these meridians, supplying the recipient with the energy that is necessary for the wellbeing of body, mind, and spirit. Meditation in motion: Thai yoga has historically been linked with Buddhist meditation, and a therapist trained with this background will silently share the benefits of their meditation practice with the client during the session (Katie has trained with Sunny Klaber, T’ai Jamar Hannah, and Peter Kaaberbol); the movement of this practice arises spontaneously and is intuitively suited to the client and steeped in the quality of Metta, translated as loving kindness, an offering which comes naturally and organically in each session. When a treatment is shared in this mindset, the entire experience emanates from the heart, and in this way, both therapist and client experience the gift of rejuvenation and peace. Why Thai? Due to a combination of trauma and poor habits (posture, diet, etc. ), energy can become blocked in the body, causing physical and emotional dis-ease. Thai Yoga can help to release these blockages and bring the body back to a state of equilibrium and peace. Thai Massage can improve flexibility, one’s posture, and aid digestive and respiratory funtions. The many sequences and assists help to tone internal organs, stretch muscles and deep tissue, and alleviate joint pain, inflammation, and ease emotional tension, among many more benefits. Technique: The practitioner uses her thumbs, palms, elbows, knees, and feet to apply a combination of acupressure, gentle rocking and twisting, joint and spine movements, and assisted yoga stretches, all of which are achieved using a steady and meditative rhythm, and body weight instead of strength; to an observer Thai Yoga would look like a graceful dance between giver and receiver. Thai is practiced on a floor mat in comfortable clothes that allow for full range of movement of joints, muscles, and bones. Core Vinyasa class incorporates all of the elements of a Vinyasa class with a strong emphasis on core strength and stability, so expect to practice abdominal, back, and deep core line exercises as warm ups and within sequences. 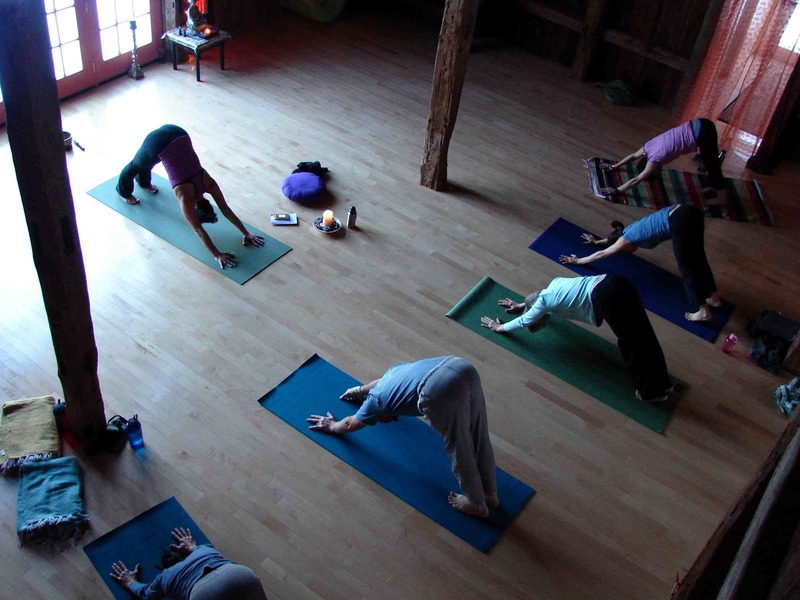 All are welcome, but class is tailored for those with a strong asana practice. Katie is certified in this style by Sadie Nardini. Meditation: This is an unguided time for sitting and breathing. Free to all attending class. Suggested $5 donation for those who would like to drop in to meditation time but not stay for asana class.